First Sentence: The owl winged noiselessly across the moon’s path and settled on a pine bough above his head. Reason for Reading: I have had Susan Slater’s Ben Pecos mystery series sitting on my shelf for some time now and thought the Summer Mystery Reading Challenge would be a great way to finally dive into the series and try an author I had yet to read before. The Pumpkin Seed Massacre is the first book in the series. This is also my first selection for the Medical Mystery Madness Challenge. Synopsis: Native American psychologist Ben Pecos reluctantly takes an internship with Indian Health Services, returning to his birthplace and early childhood home. He has been away for a very long time. A mysterious virus claims the lives of several elderly pueblo residents, including his own grandmother, raising suspicion of a possible epidemic. Joined by television reporter, Julie Conlin who hopes the story will advance her career, Ben is asked to look further into the deaths and find the root cause. Because one of the victims of the virus was the tribal governor, who had been opposed to the construction of a casino, Ben and Julie entertain the notion of possible malicious intent but cannot be sure. After all, why kill so many others if only one person was the target? The pair have their work cut out for them, and it could mean putting their own lives at risk. Comments: Three years ago, my husband and I took a road trip through the Southwestern part of the United States. Our time was limited, and so it wasn’t quite as leisurely as we might have liked, but we had a wonderful time. One of the states we visited was New Mexico, which I fell in love with instantly. The earth was rich both in beauty and tradition. 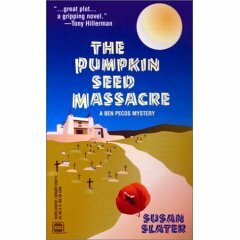 Susan Slater’s The Pumpkin Seed Massacre took me back to New Mexico, this time to locations I had not visited as well as some that were more familiar. The author artfully weaved Pueblo Native American belief and superstition into the story. She did so with respect and careful consideration. At various points in the novel, the clash between the old ways and the modern come into play. While traditions must be upheld and respected when the elders in the pueblo begin to die, the need to investigate further through science becomes a medical necessity. There is also the issue of the gambling casino; while some people, particularly the new tribal governor, are eager for the change and the promise of wealth and jobs it may bring, others remain skeptical and are strongly opposed to the changes such a public attraction would bring to their lands. This is not a mystery where the players are completely unknown. Readers follow the progress of the investigation from several different viewpoints, and so there was not a lot of guesswork needed on behalf of the reader in figuring out who is beind what. Just from the description on the back of the book (not included in my review), so much of the plot is given away, and yet there are still many questions posed in the novel worth getting to the bottom of. Ben Pecos is a charming main character and Julie Conlin, the television reporter, who also takes part in the investigation holds her own. Her ethical approach alone was enough to earn my respect immediately. My favorite of all the characters, however, would have to be Lorenzo, an elder of the Pueblo Indians. He was an endearing character, and even in his innocence, he pops up in the most unusual places. Susan Slater not only has written a suspenseful mystery but also has captured her setting in such a way as to remind me of what I loved about New Mexico so much. I will definitely be continuing on with the series. Visit the author's website for more information about her books. Very cool! I might look into this series. Never read anything by this author before. Thanks for sharing! Hers is not a name I see too often, but I'm glad I "discovered" her. I hope you will give her a try, Debi! I am not very well acquainted with the mystery genre - I wonder if this would be a good place to start? I really liked what you said about the author weaving Native American traditions into the story. Nymeth - Although I did enjoy this book, I am not sure it would be a good representative of the mystery genre. 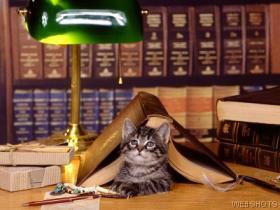 Of course, what one book would be, right? Like fantasy it's so diverse. :-) I think this book has more suspense than mystery when it gets right down to it because the who, what and how is pretty obvious from the beginning. It's just a matter of watching the good guys figure it all out. So mystery wise (and this is just my opinion), I'm not sure this would be the best book to start with if you want an introduction into the genre, however, I do think this is a worthwhile book to read.